Two leaders in medical research and health care delivery pledged cooperation, as a delegation from Thomas Jefferson University and its Sidney Kimmel Medical College in Philadelphia visited the Hebrew University of Jerusalem’s Faculty of Medicine in Jerusalem. 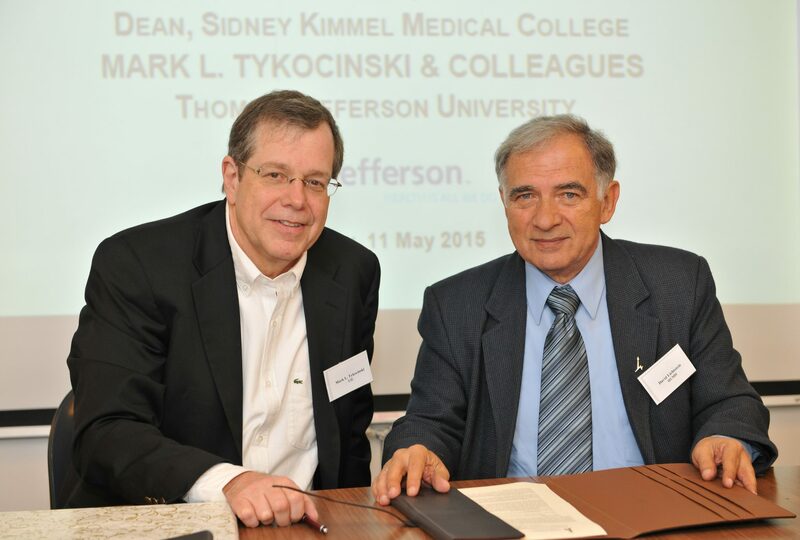 During the visit, a Memorandum of Understanding was signed by Professor David Lichtstein, Dean of the Hebrew University Faculty of Medicine, and Dr. Mark L. Tykocinski, Provost at Thomas Jefferson University and Dean of the Sidney Kimmel Medical College. The agreement calls for the two entities to expand scholarly ties and facilitate academic cooperation. In addition to promoting the exchange of academic staff, research fellows and students, the universities will seek opportunities to cooperate and collaborate on scientific research.